Ours is a story of adults who sought and found a second chance to attain a basic education, and the volunteers who worked with them one-on-one to reach their goals. 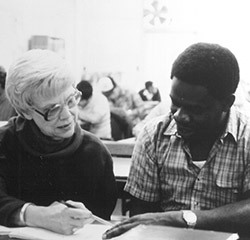 Over Literacy Services' fifty-year history, more than 30,000 adults have made this journey in partnership with their tutors. The simple idea of “Each One, Teach One” has proven to be a profound solution to the complex problem of adult illiteracy. Literacy Services was sparked by this Each One, Teach One idea. It truly captured the imagination of a small but mighty group of people who brought it to life here and around the state. We are humbled to be a part of the literacy movement that spread around the globe, and we are honored to be able to help it thrive here in Wisconsin. Our grassroots, community-built organization is a case study in American ingenuity and the power of the human spirit. Our 50-year anniversary inspired a group of volunteers to come together and produce a book full of the stories that mark our history since our humble beginning in 1965. 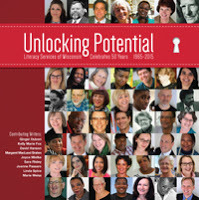 Unlocking Potential is stunning result of this volunteer team’s efforts. The book is now available for sale on Amazon.com and provides a wonderful account of our rich history along with the inspiring stories of students and alumni.